Do you want to reach millions of people who are buying products online? Do you want to add value to your site? If you answered yes to any of these questions, then join our Affiliate Program. Please click here to sign up for your affiliate account. BudgetGadgets affiliate program essentially allows you to generate revenue for every valid purchase made that originates from your business or non-business channels. When your website refers a customer to us and he or she makes a purchase, you earn a commission. We provide you with all of the tools you need as an Affiliate. 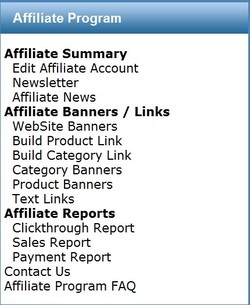 You can add links to your site and access reports online so you can see how well you're doing as an Affiliate. We handle the order, shipment, and billing. All you do is place the link and make money! Where is the affiliate program? I can't find it. Just log in your budget gadgets account, you will find the affiliate info will be launched on the left side, below the products categories. 5) We handle the order, shipment, and billing. You earn the commission. Benefits 1. Free to join. No startup or maintenance fees. Commission rates seem low? If you own a decent blog, forum, or even a website you can easily earn hundreds of dollars a day by posting some of our best sellers. Tip: begin looking on such places that generate a lot of views/replies like SlickDeals.net , FatWallet.comand WhirlPool.net.au . Don't be fooled by others who offer 10%, 15% or even more. Commission is zero when their products don't sell. We can hike our prices and offer a 50% commission rate but it makes no sense to do that. We want to offer good service and products at reasonable prices and at the same time reward you for referring us to others who will also find our offers cool. What if one of my visitors doesn't buy on his/her first visit? If you refer someone to us and they don't buy right away, then when they revisit us and purchase an item, you will automatically be credited with the sale, as long as it occurs within 180 days of the original visit. You can check you referred orders at any time online. How do I get started? Please click here to sign up for your affiliate account. Should you have any question? Please view Frequently Asked Questions page for more answers, or you can use the Contact Us form to contact us. a short link for convenience but not referal link. Note: every referal link should be with your ref number, mine is 10, but yours must be different. You can add your paypal email in the affiliate program if you didn't, and build product link or category link, referal link. And if you don't want others see the link is a ref link, build a google short url or bitly short url of that referal link.